In order to make the tools for finding the perfect voice to record a voice over faster, easier and more accessible Voices.com, the voice over marketplace , has released an "application programming interface" (API). Software developers promise another benefit that is freelance voice actors registered at the site will see an increase in work opportunities as well as the diversity of voice over requests. The Voices.com API will give opportunities to log in to client accounts, post jobs seeking voice over talent, search for voices, and complete the hiring process online, including the approval of audio samples, downloading of files and compensation of talent for their work. 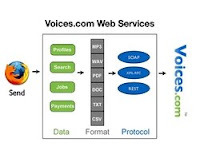 According to PRWeb.com the advantage of the Voices.com API is that developers will be able to establish, award-winning, fully functional marketplace with a global database of over 20,000 voice actors who are able to work around the clock, some recording voice overs within a matter of hours. Voice actors at Voices.com represent over 100 languages and span all time zones breaking down traditional barriers that most talent recruiters encounter. "Developers who want to use Voices.com's API can sign up for a free key online," Chief Executive David Ciccarelli shared, "and they are encouraged to profit from the resulting work. Naturally, it will become our responsibility to look for ways to solidify a partnership."